When: Saturday, August 25, 7:00 p.m.
Miami Central Outlook: The Rockets made the playoffs last season after being shut out from them in 2016. Getting bounced by eventual Class 6A state champion Miami Northwestern in the Regional Semifinals has the program fired for a possible title run to try to claim their sixth state championship in this decade which would unprecedented. However, with a program that solidly risen to the top of the crop in Cardinal Gibbons on the slate to open up the season, things will not be easy in 2018. The Rockets took care of business last week in the preseason kickoff classic against Atlantic (Delray Beach), dropping the 2018 Class 8A State Runner-up 39-7, according to the Palm Beach Post. 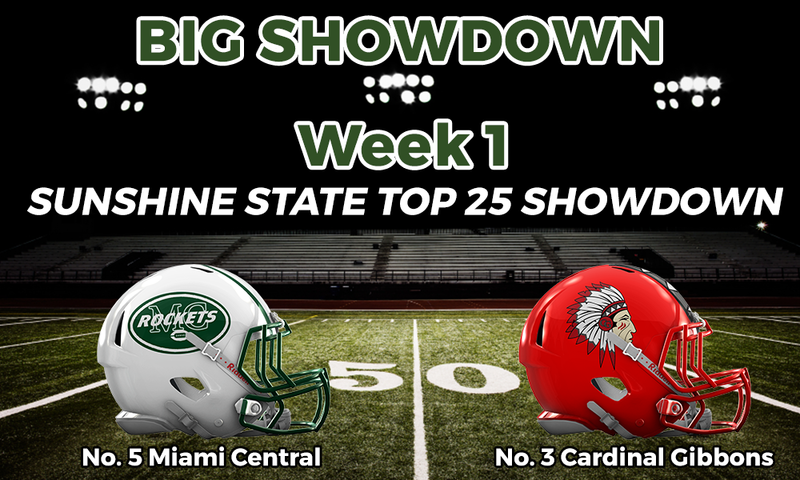 In that game, Miami Central ran over 40 first-half plays compared to just 16 for Atlantic. RB Lexington Joseph will be a key player to watch as he scored two touchdowns on nine carries for 95 yards in the game. RB Kejan Owens will also be another player to watch as he had 125 yards on 16 carries with one touchdown. Cardinal Gibbons Outlook: The Chiefs are ranked the No. 1 team right now in the FloridaHSFootball.com Class 5A rankings and for good reason: TALENT! Head Coach Matt DuBuc has been building something special in Fort Lauderdale and with the incredible amount of talent that has stayed committed to the program over the last few years and not departing for other programs has been huge. Where it all starts is with senior QB Nik Scalzo who was 14 of 16 for 208 yards last week in a 41-7 drubbing of Key West in the preseason kickoff classic in Key West, according to the South Florida Sun-Sentinel. However, they will be without defensive end playmaker Khris Bogle who suffered a knee sprain during the game at Key West and will be out for three to four weeks. With this being one of the most anticipated games in Cardinal Gibbons’ school history, the chance to take down a powerhouse team is a once-in-a-lifetime opportunity the Chiefs will be expected to take advantage of. POLL: Who wins Saturday night between No. 5 Miami Central and No. 3 Cardinal Gibbons (Fort Lauderdale)?